Safety Tested and Certificate Approved. 1.Better to keep the fountain with enough water all the time (pump should always be covered with water). 2.Due to the reflection of water and sunlight, there may be slightly difference in color between picture and actual items. 3.Ship from US, fast and safe delivery time: 3-5 business days. 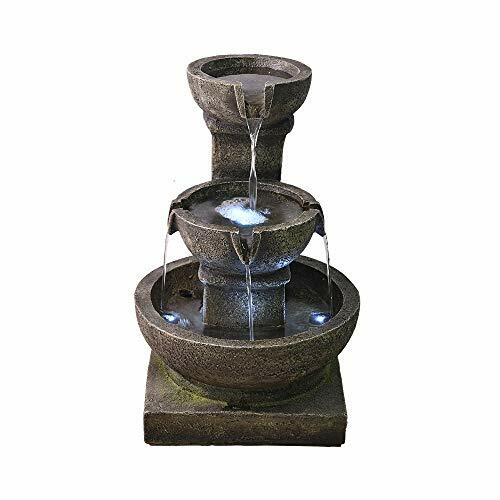 Scenery: This vintage 3-tier bowl garden fountain is suitable for decor indoor&outdoor and should be the natural beauty of the surroundings. The perfect size and running water design also will be the favorites of your lovely cat or dog. Tranquility: The outside fountains and waterfalls features very charmingly running water. The sounds of the water flow is nature and soothing, makes for you with a soothing rest or morning&afternoon tea time in the garden. Luminosity: Decor with LED lights. The LED fountain will be lighted up in the evening, and the flowing, cascading water will be illuminated in the dark, make the garden more beautiful and fantastic. Safety: The patio fountains outdoor was built-in UL-listed low-voltage recirculating water pump and adapter, easy assembly. The lengthened 78.74"(2M) power cord also provides easier set up to the yard, garden or patio. If you have any questions about this product by PeterIvan, contact us by completing and submitting the form below. If you are looking for a specif part number, please include it with your message.